The harvesting of all fish we sell has left more than enough fish for future generations, and caused no habitat destruction – none. There is no loss of marine life through incidental catch, “Bycatch”, in the harvesting process. Farming products we sell did not involve: use of chemicals or medicines, adverse use of feed from wild sources, introduction of non-native species into local fisheries, or inflict economic adversity on families and communities. The person who caught the fish was paid fairly for the work they did to bring it to you. The fish can be traced back to the vessel that caught the fish, and proper guarantees are in place regarding the honest origin of the fish. The fish comes from as local an area as possible, thus reducing carbon emissions and restoring regional cuisine. 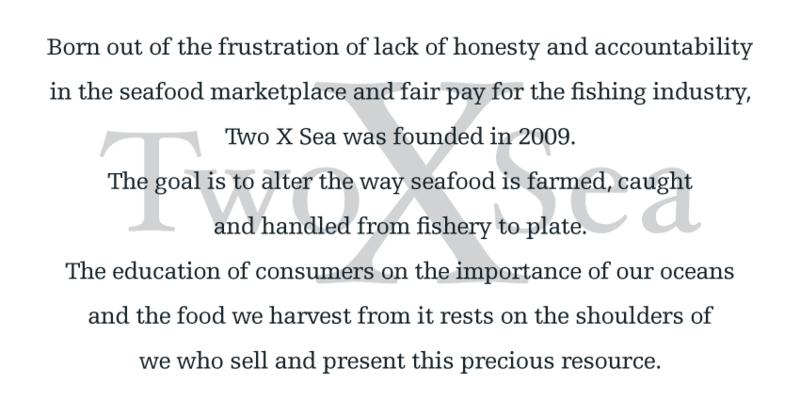 TwoXSea is working towards a better, renewable future that ensures seafood for generations to come. We welcome your questions, insights and opinions – we can’t do this alone! What you buy & when you buy makes an enormous difference to our ocean. 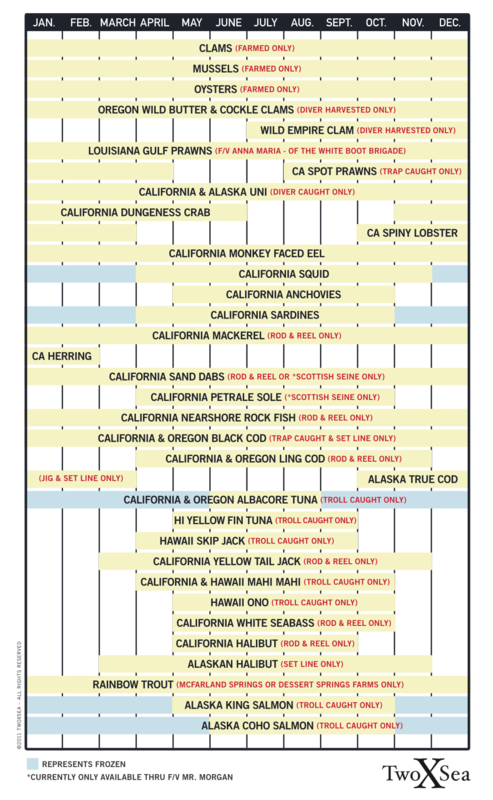 These sources not only come from healthy fisheries, but they are also caught with the strictest standards of catch methods. The catch methods we support do not deplete the resource, take unwanted by-catch or harm habitats. As the seasons change so should our buying habits; intelligent management of each fishery is based upon scientific evidence of how much each one can yield. Choosing fish that is in-season gives each species the time to fully recover from our demands for food.